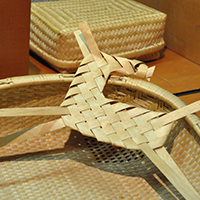 The traditional crafts industry, which has its origins in Japan's abundant natural resources and techniques spanning generations, is deeply ingrained in the regions throughout Japan. Akita also boasts many excellent traditional crafts that add color the everyday lives of its people. These crafts, developed out of Akita's magnificent nature and culture, are produced with traditional handcraft methods and techniques and bring warmth and pleasant feelings to the people who use them. In Akita, there are four traditional crafts designated by the Minister of Economy, Trade and Industry: Kabazaiku, Kawatsura lacquer, Odate Magewappa, and Akita Cedar Casks. 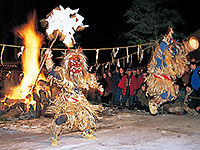 In addition, the prefecture has as designated Kawatsura Kokeshi, Itaya-zaiku, Akita Ginsen-zaiku, Omagari fireworks, and others as traditional crafts. 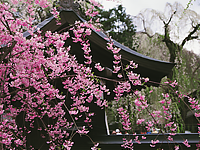 This traditional handicraft uses the bark of the mountain cherry tree. Thin pieces of the bark are shaved off then reapplied to the wood using a small metal trowel. It is said that this type of bark woodwork cannot be seen in any other craft around the world. This technique has been passed down for generations. A wide variety of tea boxes and other types of cases are fashioned with this technique. Kawatsura lacquer has its roots in Kawatsura, Yuzawa, where it was largely developed. Lacquered bowls and other such items used in everyday life are commonly made using this technique. A different craftsman works on each section of this divided production process. 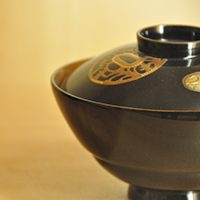 It is finished with the advanced technique known as "hananuri” to draw out the intrinsic beauty and luster of the lacquer. The clarity and texture of the lacquer comes out as it is used over time. This lacquer is applied to bowls, cups and other items. 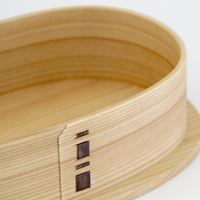 This traditional handicraft is crafted from the beautiful grain of Akita cedar. Magewappa, which uses this light and elegant wood, is known for its simple texture and refinement. Many items, such as coffee cups and other such items commonly used in modern day life, are crafted in addition to the tray and lunch box representative of this craft. Akita Cedar Casks are crafted using Akita cedar. 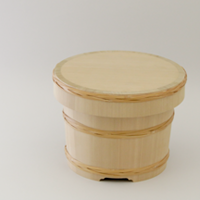 The Akita cedar wood possesses many excellent qualities. It's beautifully interlocked, straight grain produces an exquisite appearance. In addition to having a pleasant fragrance, the wood does not expand and contract much making it durable against warping. Items suited to our modern lifestyles, such as beer cups and wine buckets, are produced in addition to the common sake barrel. 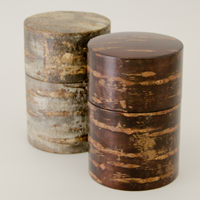 Itaya crafts are made with torn strips from the trunks of young Itaya maple trees. The strips are carefully hand-woven into items that have both size and thickness. After using an Itaya craft item for a long time, the white bark becomes a lustrous amber color that changes the craft's aesthetic appearance to one with a deeper texture. 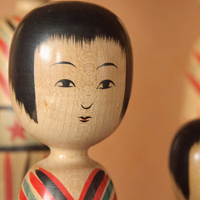 Kawatsura Kokeshi are said to have originated when a Kawatsura lacquer craftsman made a kokeshi as a children's play toy. These simple dolls, which are each individually handcrafted, each possess their own characteristics and have adorable facial expressions. Akita Ginsen-zaiku uses strands of pure silver as thin as 0.2 mm to produce delicate jewelry with the subtle radiance that is particular to silver. 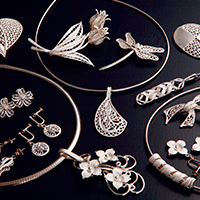 Accessories such as brooches and pendants are most commonly made. Japan's tradition of making fireworks extends all the back to the Edo period. Presently, the warimono “crysanthenum” and “peony” types of shells are the most commonly made type of fireworks. 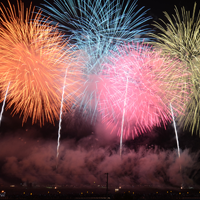 Top-notch fireworks specialists test their skills against one another for the number one seat at Japan's most prestigious tournament, the National Fireworks Competition. At this tournament, amazing fireworks, based on that year's original theme, paint the night sky. In addition to these crafts that have received designations from the prefecture and the nation, there are many other well-known traditional crafts like Naraoka-ware and Akita Hachijo textiles that have a long history in Akita. Akita overflows with crafts that are given life through the artisans' dazzling techniques and the warmth from their very own hands. Akita is located in northern Japan and faces the Sea of Japan and Ou Mountains. Situated about 450 km due north of the Tokyo Metropolitan area, Akita lies on same north latitude of 40 degrees as the cities Beijing (China), Madrid (Spain), and New York (America). 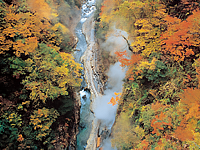 Akita is blessed with four distinct seasons and beautiful, magnificent nature. 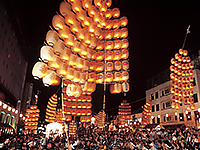 Apart from being the main producer of Akita Komachi, Japan's foremost brand of rice, Akita is also home to the fair-skinned beauties known as "Akita-bijin" and many festivals, such as Kanto, Kamakura, and Namahage. A place where one can physically experience the history and natural features of the land that grew out of the abundance of nature; that is Akita.